Let’s start with those otters: yes, they are licking their fur to keep it clean, but not so that they will look nice on postcards. Otters live in cold water. Other water-dwelling mammals like whales and seals keep warm with a layer of fat under their skin; otters, instead, rely on having a very warm coat. They keep that coat warm by stuffing lots of tiny air bubbles into their fur. Pockets of air are great for warmth: goose-down coats are warm because the downy feathers trap lots of air; cold birds fluff up into round fluffy balls because that puts more air into their feathers, keeping them warmer. Gotta smoosh enough air into my face. Unlike a layer of fat, which pretty much looks after itself as long as the animal eats enough, an otter’s warm coat has to be constantly maintained. 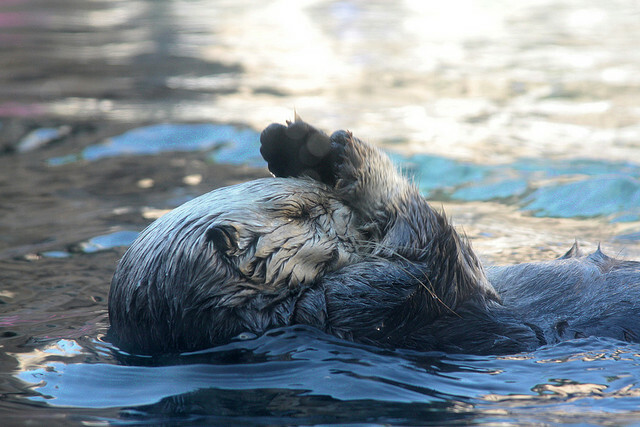 Dirty fur won’t hold air as well, so otters constantly groom themselves to keep clean and airy. This is why oil spills can be so bad for otters: if they can’t get the oil off their fur, they can’t keep air in their fur and get too cold in the frigid water. Baby otters have different fur from adults: it’s fluffier and traps more air, and so keeps them not only warm but extra buoyant. This allows an otter mom to leave them floating while she goes hunting or grooms herself and not worry that her pup will sink. Pups take a while to learn to groom themselves, and until they do, it’s up to mom to keep their fur in good condition. Perhaps the most important fur-licking the mom does is to groom her pup immediately after it is born. A newborn pup is covered in wet fur, which doesn’t have any air in it and so is neither warm nor buoyant. 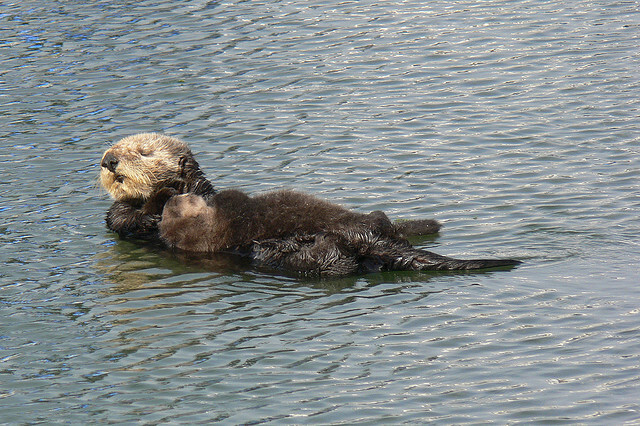 One observation of a newborn otter pup notes that “the pup’s fur was wet and lay close to its body in a manner never seen in other pups” (Sandegren et al. 1973). The mother otter “vigorously” licked her pup for two and a half hours (! ), until its fur was dry and fluffy. Okay, enough of that. You’re dry. Dirt isn’t the only thing animals get on their fur. Parasites like ticks drink the blood of the animal, pass on diseases, and just generally annoy everybody. 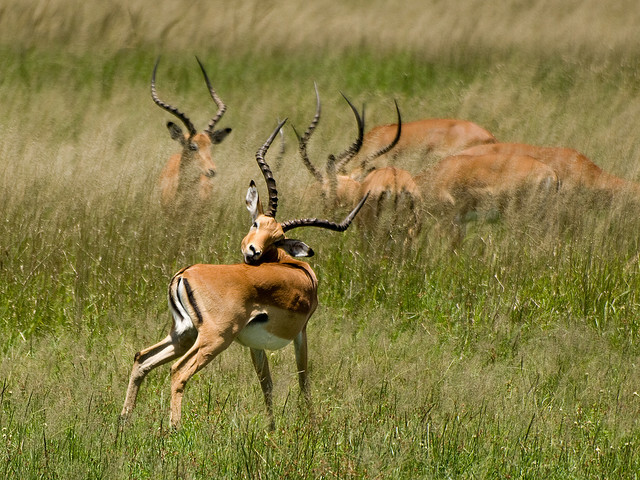 If you prevent impalas from grooming themselves, they get covered in ticks—and as soon as you allow them to groom again, they go to it with a vengeance to get rid of all those ticks (Mooring et al. 1996). 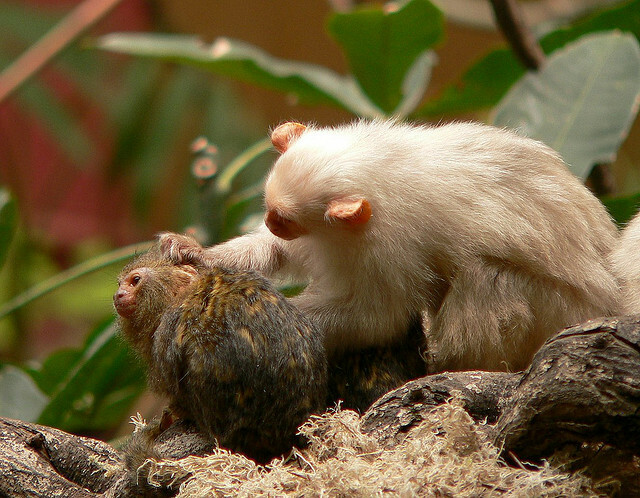 Animals that live in social groups will often groom each other. This probably started out as a hygienically-motivated practice, since it does help remove parasites and dirt, and grooming with a friend can let you reach places you otherwise couldn’t; but now many animals groom each other more than they need to simply stay clean. Your ear is clean, but I’m going to keep going. 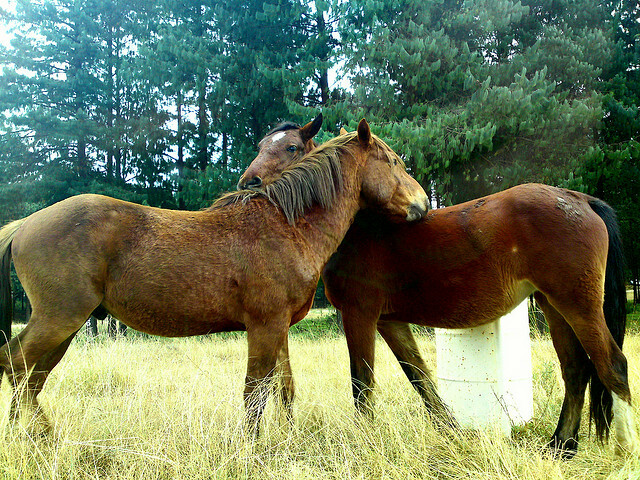 Animals like primates, horses, and bats seem to use grooming as a way to strengthen their group bonds—essentially, a way to say “We’re all friends” (Dunbar 1991). Oooooohhhh yeah that’s the spot. Is this why it feels so good to have someone brush or braid your hair? I don’t know, but I would believe it. Perhaps I should do an experiment: I’ll force my enemies to braid my hair, then see if I feel any better about them afterwards. 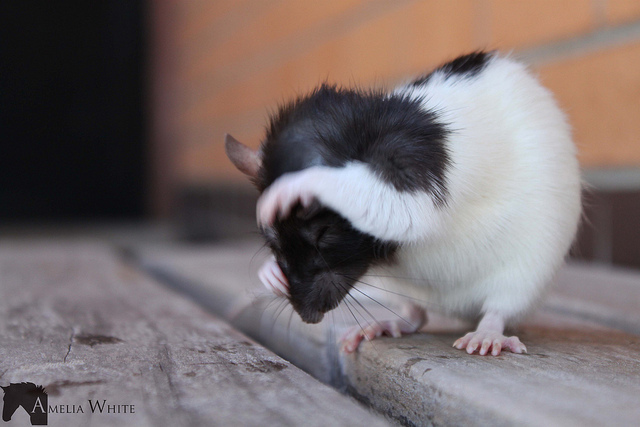 A surprisingly large number of studies have been devoted to grooming in mice and rats. (Well, perhaps not so surprising: mice and rats are common laboratory animals, so they get studied a lot.) Their grooming is often “stereotyped,” meaning it is a sequence of behaviors that they always perform in the same manner; for example, they tend to start by grooming their head and then move back along the body. They also do it at predictable times—namely, when they are stressed or anxious. They will groom when presented with a new object (scary!) or placed in a brightly-lit place (danger!). They do also groom when they aren’t stressed, but much less than when they are (Kalueff & Tuohimaa 2005). While it’s hard to get inside the head of a rodent, it seems that mice and rats use grooming as a way to calm themselves down. Dunbar R. 1991. 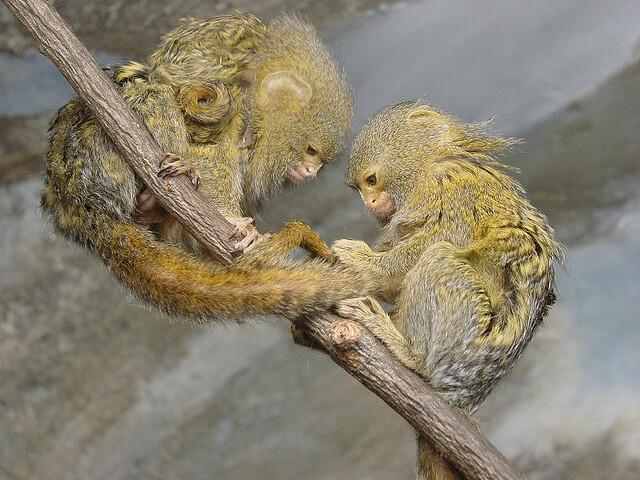 Functional significance of social grooming in primates. Folia Primatologica 57:121-131. Hart BL, Powell KL. 1990. Antibacterial properties of saliva: role in maternal periparturient grooming and in licking wounds. Physiology and Behavior 48:383-386. Kalueff AV, Tuohimaa P. 2005. The grooming analysis algorithm discriminates between different levels of anxiety in rats: potential utility for neurobehavioural stress research. Journal of Neuroscience Methods 143:169-177. Mooring MS, McKenzie AA, Hart BL. 1996. 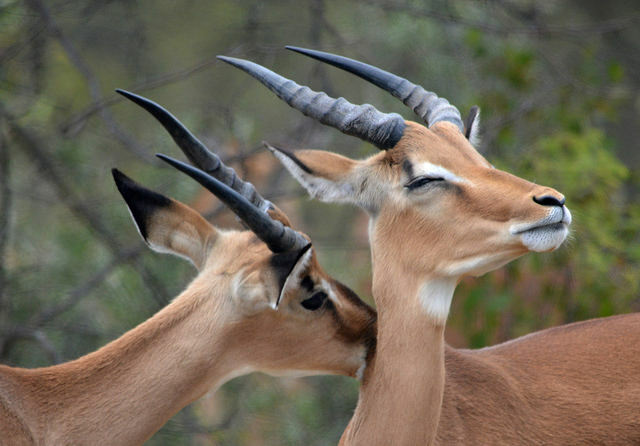 Grooming in impala: Role of oral grooming in removal of ticks and effects of ticks in increasing grooming rate. Physiology and Behavior 59:965-971. Sandegren FE, Chu EW, Vandevere JE. 1973. 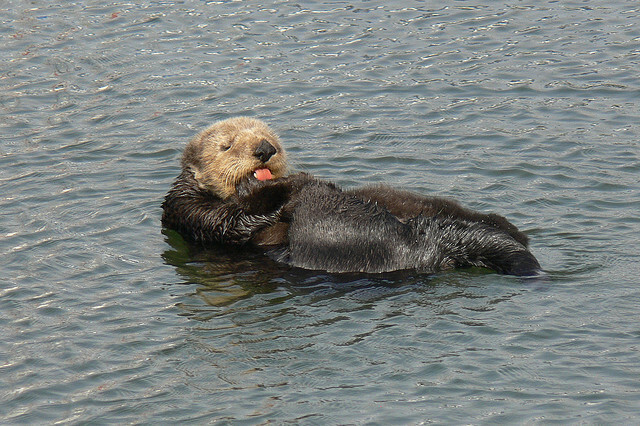 Maternal behavior in the California sea otter. Journal of Mammalogy 54:668-679. This entry was posted in general science-y stuff, other people's research and tagged animals, behavior, grooming, otter, science by toughlittlebirds. Bookmark the permalink. Great post. I saw my first sea otters a few weeks ago and definitely noted the grooming. It seemed like a lot of work but according to you it’s all for a good cause. I’m glad you got to see the otters! They do spend a lot of time grooming. They also do a lot of rolling over, if you noticed that; that’s a behavior that helps to get air into the fur. As always, an informative and nicely written post. Thanks.